Andre Timothy Jackson Jr., a homeless veteran, is being held on a $100,000 bold and faces up to 99 years in prison. A 27-year-old ex-Marine from Houston has been charged with murder in the stabbing death of 11-year-old Josué Flores, who was walking home from school last month, police said. Andre Timothy Jackson Jr. was arrested Friday afternoon at the Salvation Army in downtown Houston and charged later in the day, Mayor Sylvester Turner said at a weekend news conference. 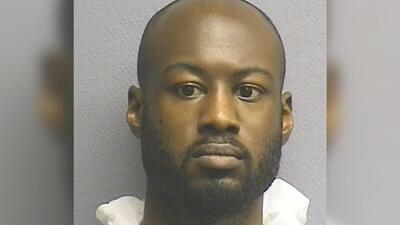 Jackson is being held in the Harris County Jail on $100,000 bond, according to court documents. It wasn't immediately clear whether he had an attorney. Jackson, who police said was discharged from the Marines in 2011, is accused of stabbing the sixth-grader as he walked home from school May 17. The boy’s murder inspired a citizen movement in Houston, where community members have held protests and spoken out about insecurity. "We cannot bring him back, but I hope today's announcement can perhaps bring a little bit of comfort to those who love him," Turner said. "Our minds search for answers that just aren't there. What we do know is it was senseless, it was brutal, it was cold-blooded. And someone needs to pay the price for it and justice needs to be rendered." There is no motive in the slaying and no known connection between Jackson and Josué, police said Saturday. Jackson is a veteran who had lived at the Salvation Army since mid-April, according to Houston police Lt John McGalin. Earlier this week, authorities released surveillance video featuring a "person of interest." The 36-second video showed a man running down a street not far from the scene wearing a green jacket with a partially obscured word containing the letters "LYMEN" on the hood of the jacket. The video brought a tip about another video, which led investigators to Jackson, McGalin said. Jackson had the jacket with him when he was arrested, McGalin added. Authorities initially charged a 31-year-old man with a long criminal history days after the killing, but that charge was dropped when detectives found evidence to support his alibi. Questioned Saturday about how he was sure the right man has been arrested, McGalin said that Jackson's alibi could not be verified and that he "provided a statement that corroborated a lot of things we knew to be true and led us to believe we have the right guy." Several witnesses told officers they heard loud screaming and saw Josué struggling with a man. The boy collapsed on the grass near the sidewalk and the man ran off. A bystander flagged down police and alerted them to the wounded boy, who was taken to a hospital with multiple stab wounds and pronounced dead a short time later. Investigators reconstructed the suspect's trail using video from residents' homes and businesses, McGalin said, though some of the surveillance footage came in slowly. "People didn't know what they had until we went and knocked on their door and actually caught them at home," McGalin said. "We pieced it together. We believe we know the track that the suspect walked." At the Saturday press conference, Harris County District Attorney Devon Anderson added: "After hearing the evidence they've collected over the last couple of weeks I feel confident we can secure a conviction in this case." Jackson faces up to 99 years in prison.